After a couple of years, I got rid of the desk. Now the groups have more room to move. We can talk about having a “student-centered” classrooms all day, but how do we prove it to our students? 1. I left my posters at home. 2. I got rid of my teacher desk. A Better Message. When the room was decorated with my stuff, I sent a clear message to students: The classroom is my space. That message wasn’t bad, but I like the new message better: This classroom is a space that we construct together, and everything that we do with the space demonstrates learning. More Flexibility. By ditching my desk, I freed up 30 square feet of floor space. So there’s more breathing room for group work. There’s more space for performances. And I’m forced to be mobile. Getting Closer. If I’m sitting in the classroom, it’s at a student desk. By opting out of the special furniture for me, I’m putting myself in the process with the students. Saving Time. I don’t spend time decorating anymore. Well, at the end of the day, I sometimes have to arrange the students’ work so that it’s more useful and accessible as a teaching tool. But that “decorating time” is also planning time, because while I’m arranging, I’m also looking at what the students have accomplished and considering adjustments to tomorrow’s lessons. Collaborative, Public Annotations. Years ago I required students to annotate their own textbooks, but I found that there were wide varieties of skill at the task of looking for things to comment on. Some students had great annotations, others didn’t, and that was the end. But when I went public with annotation, I found that the results were much more interesting. 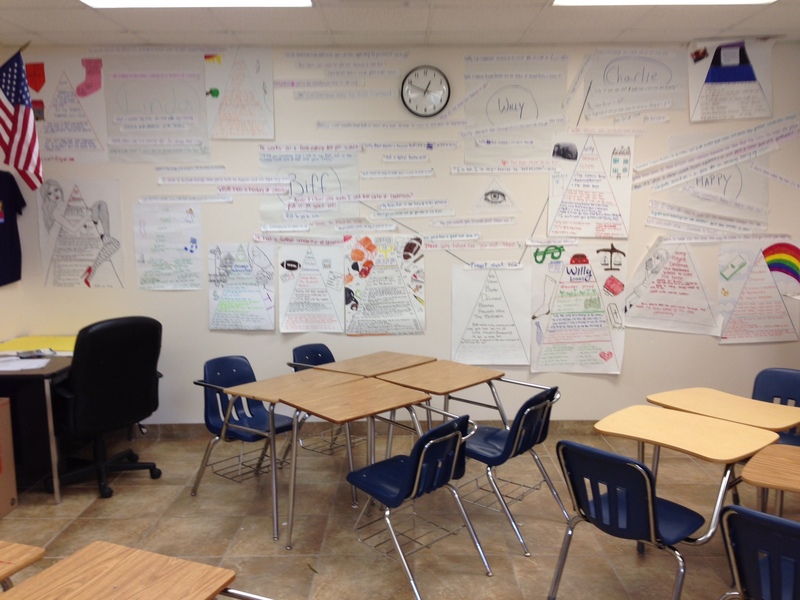 And when I left them stuck to the wall, students could revisit them — especially during assessments. 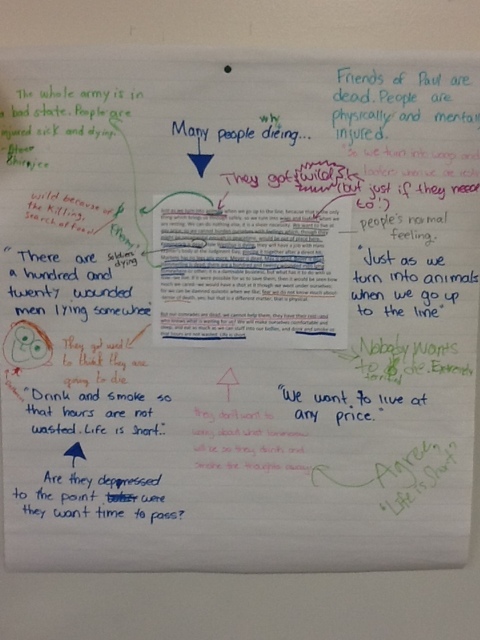 Group Annotations on a passage from All Quiet on the Western Front. Sentence Collecting. Every year I go to an office supply store and buy ten or twelve rolls of cash register tape. When I want students to find phrases and sentences that reveal details about character, setting, or anything else, I send them searching, and then they copy these phrases onto the strips and stick them to the wall. Post Individual Artifacts. Early in the year I like to have students respond to a poem or story that invites students to look at their own lives. One piece that I like is “The Tally Stick” by Jarold Ramsey. After spending a class period working with the poem, I invite students to create their own “Tally Sticks” for their lives, and then I left them stuck to the wall at the front of the room. Each student then had part of himself on the wall, giving ownership to the students. 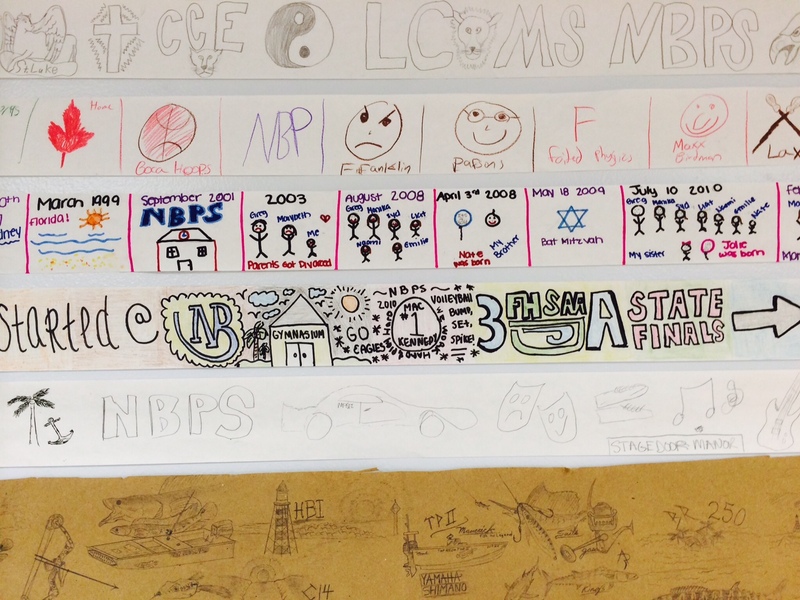 I covered the top of my front wall with students’ life stories told in pictures. A happy English teacher with massive potential for growth. Trying to share the best I have to offer with the teaching world.